Some years ago, in the early 1990’s an eminent Librarian asked me “Do you wait until you have five bacon’s and then print a catalogue?” and I thought to my self… don’t you read the others? But Really I knew there was something to it, so in response I did a short catalogue of Bacon’s! 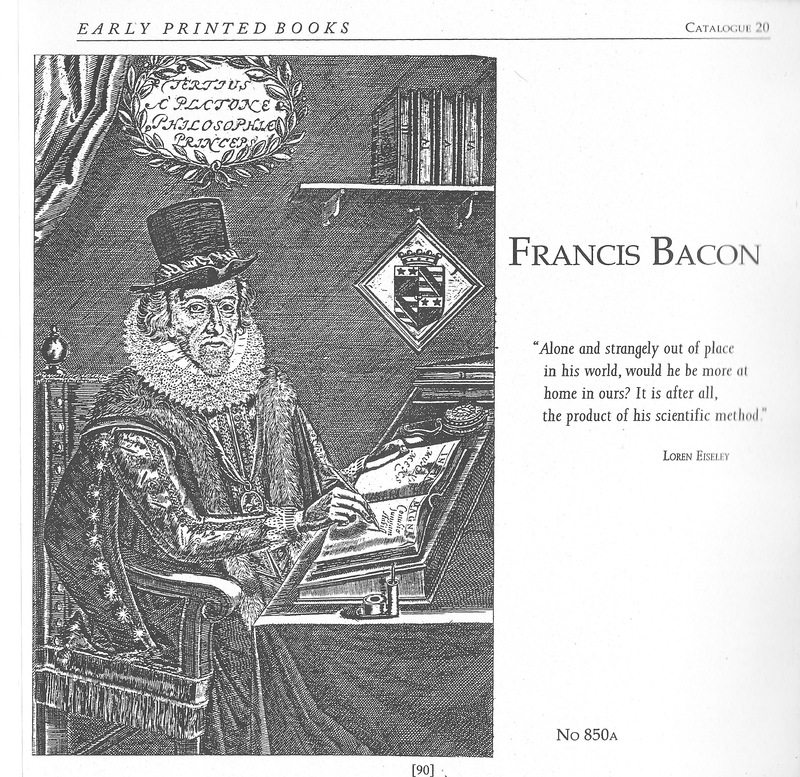 “[Bacon’s] Essays, the fruits of his political and social observations, were first published in 1597, enlarged in 1612, and again in 1625. This 1629 edition contains all 58 essays. STC 1149; Gibson 15 Pforzheimer 31. The Two Bookes of Sr Francis Bacon, Of The Proficience and Advancement of Learning, Divine and Hvmane. To the King. Quarto, 6.75 x 4.8 inches. Third edition. A-Z4, Aa-Tt4. This copy is bound in full nineteenth century sheep. Of The Advancement And Proficience Of Learning or the Partitions Of Sciences ix Bookes Written in Latin by the Most Eminent Illustrious & Famous Lord Francis Bacon Baron of Verulam Vicont St Alban Counsilour of Estate and Lord Chancellor of England. Interpreted by Gilbert Wats. Small folio, 260 x 175 mm. First complete edition of this work in English. ¶4, ¶¶2, ¶¶¶1, A2, B-C4, aa-gg4, hh2, †4, ††2, †1, A-Z4, Aa-Zz4, Aaa-Qqq4, Rrr2. complete. Sylva Sylvarum, Or, A Naturall History, In Ten Centuries. Written by the Right Honorable Francis Lo. Verulam, Viscount of St. Alban. Published after the Authors Death, By William Rawley, Doctor in Divinitie, One of His Majesties Chaplaines. Hereunto is now added an Alphabeticall Table of the Principall Things contained in the Ten Centuries. Folio, 7 x 10.4 in. Fourth edition. π2, A-Z6, Aa-Bb6, Cc4, a-g4 (g4 is blank). 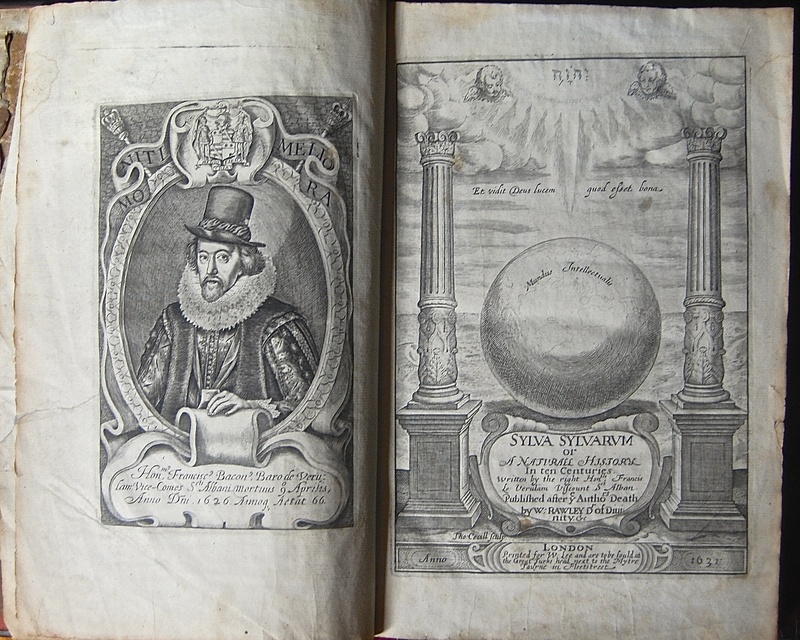 The engraved title page and portrait of Bacon dated to 1631 and 1631 respectively are both present in this volume. This copy is bound in its original full calf. Binding tight and firm. A good clean copy of an early edition. This book is ‘the foundation of all,’ consisting of all of Bacon’s empirical experiments along with his utopian fable, The New Atlantis. STC 1172; Gibson #174. The History Of the Reigne of King HenryThe Seventh. Written by the Right Hon: Francis Lo: Verulam, Viscount S. Alban. Whereunto is now added a very vsefull and necessary Table. Folio, 11 1/3 x 7 1/2 inches. Third edition. A reissue, with cancel title page, of the 1628 edition. [A2], B-Z4, Aa-Ll4, Kk5. The title page is printed inside a large and handsome woodcut border. This copy does not have the portrait of Henry. “Of the historical works, besides a few fragments of the projected history of Britain there remains the History of Henry VII, a valuable work, giving a clear and animated narrative of the reign, and characterizing Henry with great skill. The style is in harmony with the matter, vigorous and flowing, but naturally with less of the quaintness and richness suitable to more thoughtful and original writings.” (Encyclopedia Britannica, eleventh edition, entry on Bacon.) Bacon’s ‘Historie’, which may practically be regarded as the earliest of English historical monographs, was actually composed in 1621, probably after Bacon, on his release from the Tower, had returned to Gorhambury. […] It is, in the main, founded on Bernard André and Polydore Vergil, with Fabyan and the later chroniclers, and a few additions by Stow, and, more especially, by Speed, some of whose mistakes were copied by Bacon. The essays or counsels, civil and moral, of Sir Francis Bacon, Lord Verulam, Viscount St Alban. With a table of the colours of good & evil. Whereunto is added the wisdom of the antients. Enlarged by the honourable author himself; and now more exactly published. London: Printed by M. Clark, for Samuel Mearne, in Little Britain, John Martyn, in St. Pauls Church-yard, and Henry Herringman, in the New Exchange, 1680. Octavo, 8.5 x 14 cm. Twelfth edition. A6, B-Z8, Aa-Bb8, Cc3, [Cc4]; lacks the final blank leaf. This copy is bound in original boards, recently rebacked. Wing B-288; Term Catalogue I, 388;Gibson- Bacon #24a, Gibson-St. Thomas More, cf 815.